The hilarious Mexican wrestler, Taco Malo, is back to meet a new opponent in ring in the new Lucha Libre 2 slot from Realtime Gaming. Intertops Casino is giving introductory bonuses up to $500 that include up to 50 free spins. The new game arrived at Intertops Casino just today and it’s quickly becoming a favorite. 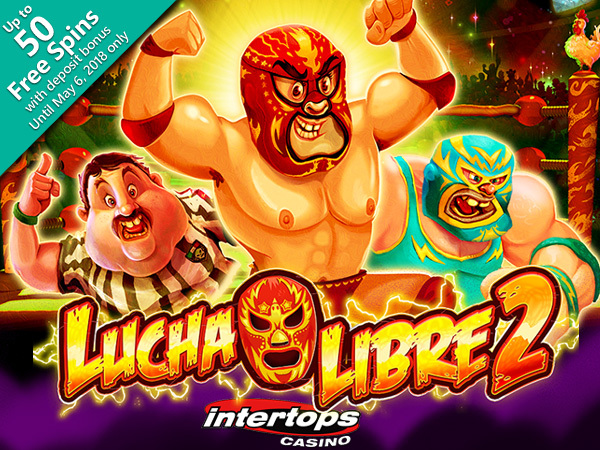 Like the original Lucha Libre slot, the new Lucha Libre 2 has several bonus features to top up players’ winnings. There are instant prizes to be won in the Time to Rumble bonus feature where players choose one of three moves for Taco Malo to use against his over-sized opponent. Backbreaker? Facebuster? Piledriver?! Choosing the right move wins bigger prize multipliers and more Fist of Fury free spins.